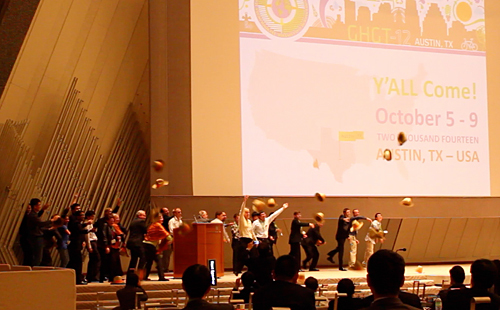 Representatives from UT toss cowboy hats in the air as they invite the greenhouse gas technologies community to Texas for GHGT12. November 24, 2012: Just announced at GHGT11 in Kyoto, Japan: The University of Texas at Austin will be the primary host of The 12th International Conference on Greenhouse Gas Technologies (GHGT12), which will be held in Fall 2014. The primary sponsor of event is the United States Department of Energy. The GHGT conference series has established itself as the premier international conference on greenhouse gas mitigation technologies. The conference is held every two years, in IEAGHG member countries, and has become a focal point for international research on CO2 capture and storage. The GCCC was delighted to host visiting researcher Lia Bressan from CEPAC. December 20, 2012: Exchange between Center of Excellence in Research and Innovation in Petroleum, Mineral Resources and Carbon Storage (CEPAC) and GCCC. 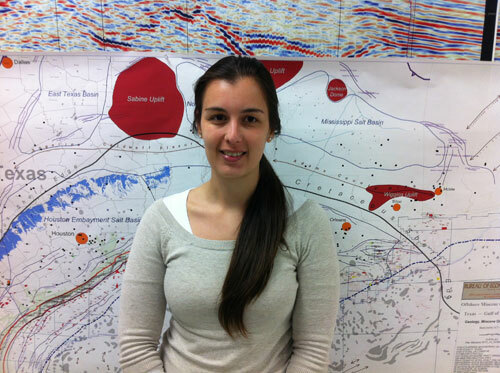 Lia Bressan from CEPAC (Brazil) spent the last two months at GCCC as a visiting researcher. She focused on learning CO2 monitoring methods, including gas tracers and soil gas monitoring. She will transfer knowledge of these techniques to be used in CEPAC's upcoming campaign of CO2 injection, a project called MMV CO2 Field Lab. Katherine Romanak (left) and STORE's Hilary Olson (center, right) organized the side event on CCS. November 27, 2012: United Nations Framework Convention for Climate Change/COP-18 The University of Texas at Austin partnered with the Carbon Capture and Storage Association to host a Side Event focused on "CCS Capacity Building and Global Status: Educational Opportunities and Lessons Learned." Katherine Romanak chaired the event. Hilary Clement Olson discussed the various geological carbon storage capacity building initiatives undertaken by the university's STORE training center. The University of Texas at Austin also hosted an exhibit booth at the meeting, promoting geological carbon storage research, education and training programs at various university units: the Department of Petroleum and Geosystems Engineering and the Gulf Coast Carbon Center at the Bureau of Economic Geology and the Institute for Geophysics. November 8, 2012: The Carbon Sequestration Leadership Forum (CSLF) recognized Air Products & Chemicals, Inc. (Allentown, Pa.) at its recent meeting in Perth, Australia. The GCCC provides monitoring expertise to Air Products and Chemicals, Inc., which is shipping CO2 from its hydrogen plant at the Valero Refinery in Port Arthur TX for injection into the West Hastings Field oil reservoir as part of an enhanced oil recovery effort. For more information about this project please click here. Along with the other recognized projects, the Air Products & Chemicals, Inc. project will appear in a yearly project portfolio on the CSLF website to keep the global community updated on progress. With CSLF recognition, these cutting-edge projects will gain enhanced global visibility and widespread knowledge-sharing opportunities. 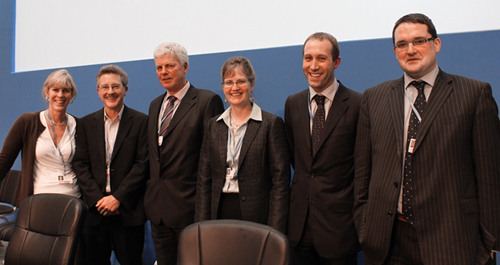 Two other GCCC projects, the Frio Pilot Project and the SECARB project at Cranfield, have previously been previously recognized. 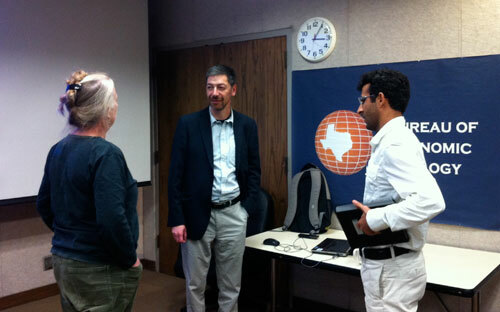 Susan Hovorka and Mehdi Zeidouni converse with Boris Gurevich following his talk. 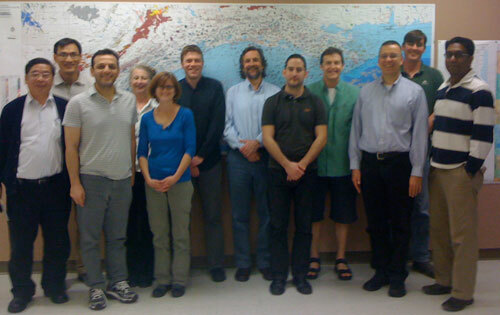 October 22, 2012: EOS, a news magazine of the American Geophysical Union. Research by Katherine Romanak, Changbing Yang, and Susan Hovorka (A process-based approach to CO2leakage detection by vadose zone gas monitoring at geologic CO2 storage sites. Geophysical Research Letters, doi:10.1029/2012GL052426, 2012) was featured in the Research Spotlight of the October issue of EOS. Click here to link to the story [PDF]. Po-Yu Wu of CPC Corporation in Taiwan with GCCC staff during a visit in October. September 17, 2012: EarthSky. Susan Hovorka is interviewed by the popular science media source about carbon capture and storage, and what's known and what's a challenge. She says, "It's a personal and financial decision we need to make it as a community of energy consumers. But the possibility is completely available to us, to move forward on this option." Read the full interview here [Link]. August 12-18, 2012: 6th IEAGHG International CCS Summer School. Marlo Gawey was one of forty-seven students representing twenty-two nationalities selected to participate in the Summer School. Katherine Romanak participated as as a lecturer and mentor. Tsinghua University, Beijing, China. Marlo Gawey works with international students on a group project during summer school. Katherine Romanak with other mentors and lecturers at the summer school. 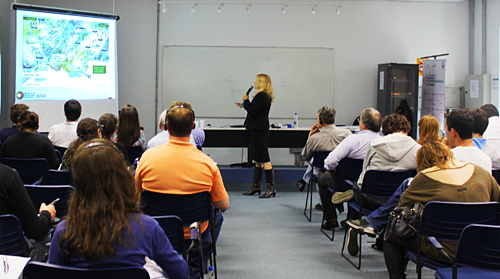 Vanessa Lopez-Nunez lecturing during the CEPAC workshop in Brazil. July 30 - August 3, 2012: Understanding Carbon Capture and Storage. Vanessa Nuñez-Lopez will teach part of this short course sponsored by The Center of Excellence in Research and Innovation in Petroleum, Mineral Resources and Carbon Storage (CEPAC) and the Carbon Sequestration Leadership Forum (CSLF) at the Pontifical Catholic University of Rio Grande in Porto Alegre, Brazil. 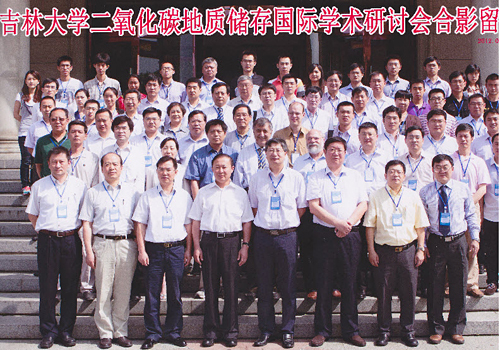 Yang, second row in blue shirt, with CCS experts and students at Jilin University. Khandaker Zahid (leaning over table) attends a RECS workshop conducted by Dr. Jack Pashin, Director of the Energy Investigations Program at the Geological Survey of Alabama in their Tuscaloosa core warehouse. 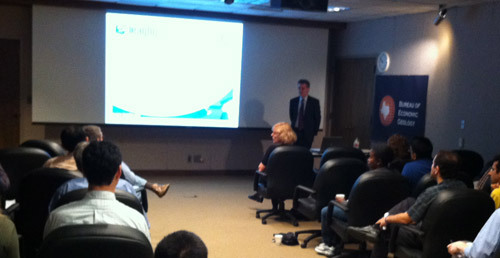 May 22, 2012: Climate Change Subcommittee Greater Houston Partnership (GHP). Sue Hovorka presented "CCS Technology Update" via phone. May 20, 2012: GCCC Students Hit the Road for Summer. Summer is around the corner, and GCCC students are taking advantage of the break from classes to gain-on-the-job training. Click here for the full story [PDF]. May 17, 2012: The paper "Analytical model for CO2 injection into brine aquifers containing residual CH4" written by lead author Seyyed Hosseini has been accepted for publication in Transport in Porous Media. May 15, 2012: Congratulations to Katherine Romanak, Changbing Yang, and Sue Hovorka for their presentation at the Annual CCUS meeting, which was selected as one of the top 12 among hundreds. Their work, "Monitoring CCS-EOR Systems Using a New Process-Based Leakage Detection Method: Assessment of Allegen CO2 Leakage at the Kerr Farm Weyburn-Midale EOR Field, Saskatchewan," was chosen by conference attendees on the following merits: ground-breaking, insightful, and innovative. March 28, 2012: "Sensitivity of groundwater systems to CO2; application of a site-specific analysis of carbonate monitoring parameters at the SACROC CO2-enhanced oil field" by Katherine Romanak, Rebecca Smyth, Changbing Yang, Susan Hovorka, and Jiemin Lu has been accepted for publication in the International Journal of Greenhouse Gas Control. A sensitivity analysis from SACROC indicates that the concentration of dissolved inorganic carbon (DIC) is a strong indicator of CO2 in modeled environments, suggesting that site-specific characterization of an aquifer may not be necessary if DIC is used as the primary monitoring parameter. GCCC's Jiemin Lu is lead author on a paper published in the Journal of Chemical Geology, "CO2-rock-brine interactions in Lower Tuscaloosa Formation at Cranfield CO2 sequestration site, Mississippi, U.S.A." The authors conclude that the rock in the reservoir at Cranfield is relatively unreactive with CO2. The potential for mineral trapping as well as geochemical changes that might impact freshwater are minimized. March 19, 2012: The paper "Scoping analysis of brine extraction/re-injection for enhanced CO2storage" by Seyyed Hosseini and JP Nicot has been accepted for publication in the journal Greenhouse Gas Science Technology. 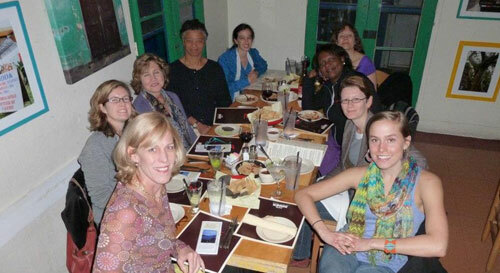 Climate Wise Women is a group of grassroots women community leaders who travel the globe to share their experiences of living with climate change. Romanak is seated at the head of the table. GCCC staff with Stuart Haszeldine, Stuart Gilfillan, and Domokos Gyore (center) and Shoung Ouyang (left). The Rosenfield Plaque awarded to Carey King. February 28, 2012: Carey King Receives Rosenfield Plaque. 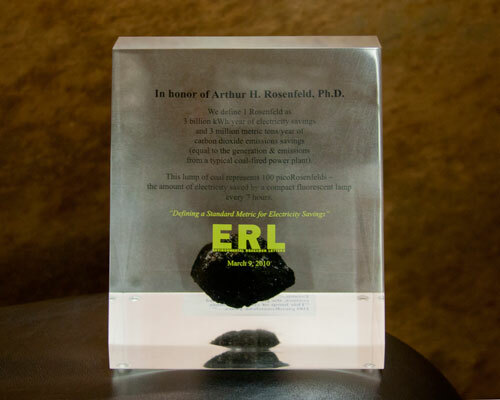 This one time award was presented to King in recognition of his outstanding work in the field of energy economics for his paper titled, "Energy intensity ratios as net energy measures of United States energy production and expenditures" published in Environmental Research Letters. King described a new method to measure energy return on energy invested (EROI) that can be estimated every year, rather than the previous best method which gave estimates at best every five years. To read the press release describing the work, please click here. Tim Dixon of the IEAGHG R&D Programme speaks to GCCC staff.